The “Cardiac Rehab Patient Monitoring Jacket” is a jacket that is intended to help cardiac rehab nurses monitor patients. After a cardiac surgery, such as a bypass or a cardiac cath, most patients are required to participate in some form of cardiac rehabilitation. Often times this requires the patient to participate in monitored rehab therapy in a hospital gym. After a heart procedure it is very important that the patient monitor their heart rate to ensure that they do not exceed the threshold set by their physician. During the monitored gym exercise it is not uncommon to see a number of patients exercising at the same time, therefore requiring one cardiac rehab nurse to monitor multiple patients. Typically the patients are connected to heart rate monitors that are watched by employees on a screen at the nursing station, and an audible alarm is set to each patient. The difficulty with this is that there is potential for the alarm to go unnoticed if the noise level in the gym is high due to multiple patients using the equipment. Imagine monitoring a video screen with twenty treadmills running simultaneously, and having to listen for an audible alarm while dealing with a patient at the desk. There is a potential for a patient’s overexertion to go unnoticed. Even the patient may overlook that they have exceeded their threshold. It is not difficult to imagine a patient who does not realize that they are above their target heart rate simply because they were used to working out at a much higher level before they had their procedure. The “Cardiac Rehab Patient Monitoring Jacket” is a means to supplement the monitoring processes already set in place, and provide additional levels of safety to monitored cardiac rehab exercise. The jacket allows that each user can have their heart rate threshold programmed into the jacket based on their physician’s recommendation. A 50 year old patient, who was an avid runner pre-procedure, who had a single cardiac cath inserted will likely have a higher threshold than a 65 year old patient who had triple bypass and lived a largely sedentary lifestyle. The limits would be set according to the patient’s perceived fitness level, and their physician’s suggested limits of physical activity. The patient will wear a wireless chest-strap heart rate monitor which is interfaced with the jacket. Once the heart rate limit is exceeded the 64 LED matrix will light up to signal that the patient needs to slow down and lower their heart rate. This not only allows for the cardiac rehab employee to monitor the patient, but will also signal the patient and other patients to the situation. If the employee was distracted by another patient, or failed to hear the audible alarm, then hopefully the patient would be made aware of their overexertion, or perhaps another patient who is in the gym. 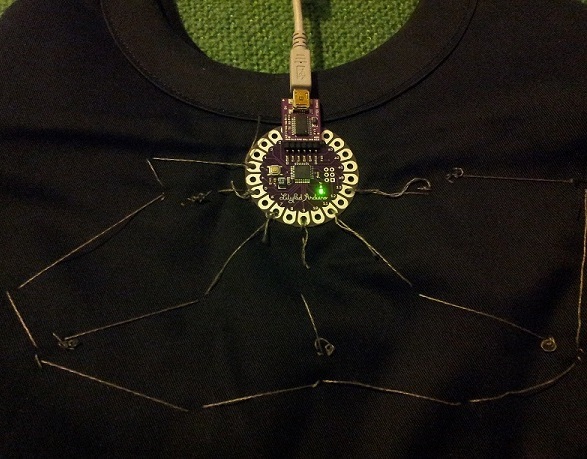 The jacket is powered by two battery packs that use 4 AA batteries, and have on and off switches. 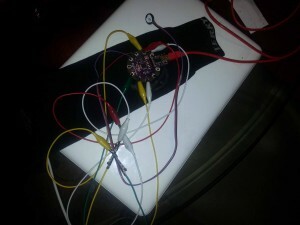 The heart rate monitor interface (HRMI) is connected to an Arduino Uno, and the Arduino is connected to the Adafruit NeoPixel NeoMatrix 8×8. The program that runs the system allows that the heart rate threshold can be changed in the first few lines of the code to fit the designated parameters of each individual patient. The pixel matrix is activated once the heart rate threshold is exceeded, and will automatically turn off once the heart rate returns to normal. Taking into consideration that most cardiac patients are older, the simplicity of the jacket is a key factor in the success of its implementation. 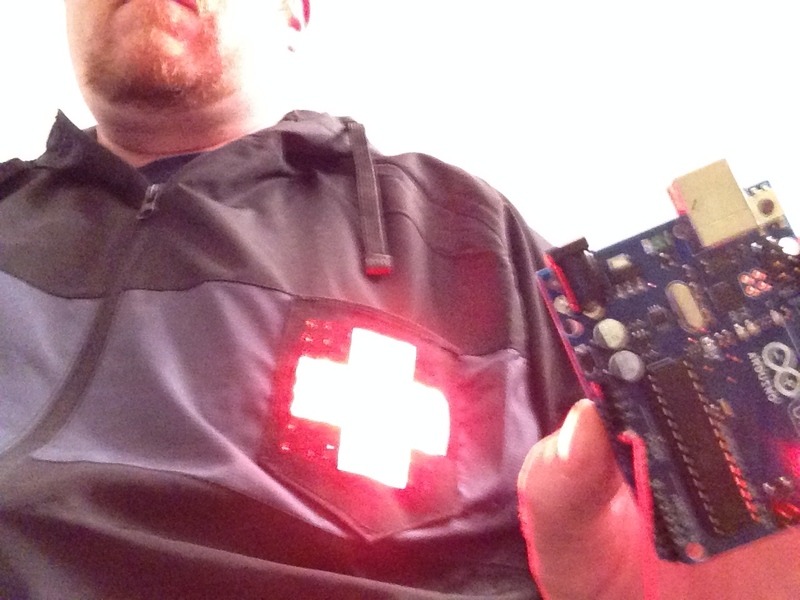 The cardiac rehab employee will program each Arduino based on consultation with the patient’s cardiologist, and each jacket will be assigned to one patient. As the patient recovers, the values of the threshold can be changed according to their physician’s recommendations. This will also allow that the patient has a simple means of self evaluation. A patient who is unfamiliar with using heart rate monitors can be easily taught that if their jacket lights up, they need to back off on their workout. This will help the patient in understanding their personal limits, and provide a simple means of monitoring how their fitness level was affected by their procedure. The use of wearable technology in healthcare is not a new idea, and there are many products that incorporate vital signs in their features, but for these products to truly be effective, they must be simple enough for a patient with no clinical or technological background to use and understand. Bradley Quinn provides multiple examples of diagnostic textiles that are being used in healthcare, and notes the importance of wireless garments that monitor the patients “in a range of everyday situations” (Quinn, 2010). Quinn acknowledges garments such as the Heart Sensing Sports Bra, the Heart Sensing Racer Tank, and the Cardio Shirt for Men, but the impressive capabilities of these garments can also be considered a hindrance. 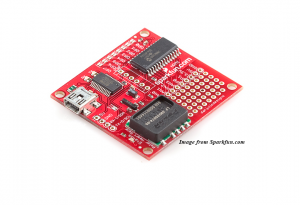 These products often require additional software applications, and are designed for athletes and fitness enthusiasts. In some cases their technological capabilities can be a deterrent to users who are not tech savvy. It can be intimidating for a user to not only be required to monitor their vital signs, but to also have to learn new technology. Products like the Adidas micoach provide a variety of functions that could serve the same purposes as this project, but in the case of many patients, the additional time required to learn to use the product (and the added cost) would be one more stress factor that could be avoided with a more simple product that is focused on one key function. These products are also designed to provide the user with information that is used for fitness tracking and monitoring with no way to alert others that the user is in trouble. The simplicity of this project could be seen as a benefit to the patient and anyone in the general vicinity of the patient. Future versions of the project could include features that would allow for the jacket to be used outside of a hospital setting. Because the entire project operates independently of any hospital equipment, the patient could also use it during their daily exercise routine. After the patient has completed their required rehab schedule they could benefit from the reassurance that they could continue using the device. If an additional alarm was included in the project, it could be used as a means of alerting someone who is unfamiliar with the project that something is wrong. For example, a patient who has recently completed her monitored exercises takes daily walks in her neighborhood. During one particularly hot day, she begins to feel fatigued and exceeds her preset threshold. 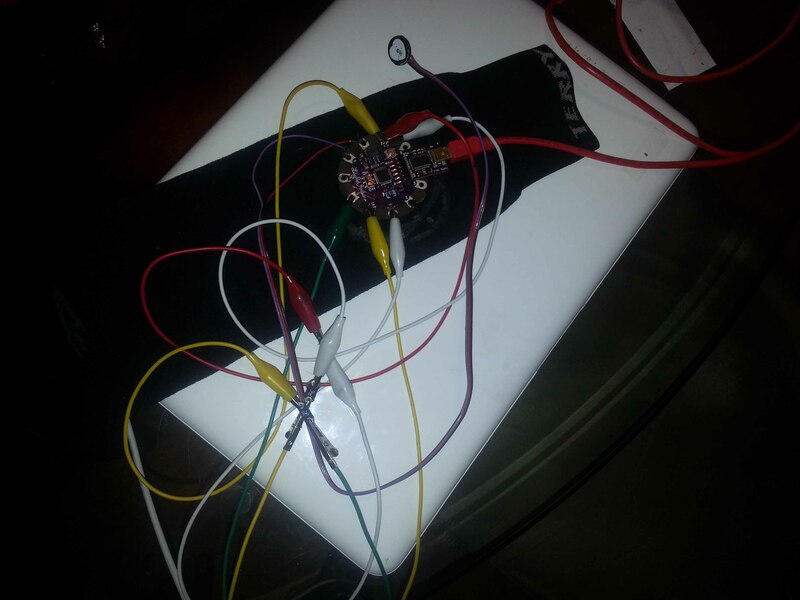 The device is activated, and the LED matrix lights up and an alarm sounds. 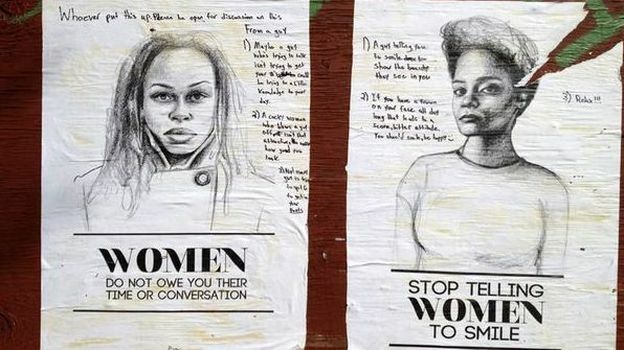 This could alert anyone passing by that the woman is in need of help. Whether the person passing by is familiar with the product or not, it would be clear that something was wrong, and it would be likely that they would notice the alarm and lights, and hopefully this would prompt the good samaritan to investigate. Complexity does not always equate to increased functionality, and it is likely that there is a large population who would welcome a product that provides a simple (but potentially life-saving) service. I have always have a fascination with the “space world”. Being a fashion student, I could only dream to be so avant garde like Jean Paul Gautier in his creations for the Fifth element. While working with LEDs this semester, I thought to myself wouldn’t it be cool to have tiny LEDs at the tip of your eyelashes. It would be something you will see in a Sci-Fi movie. So I goggled to see if such a product exist. I came across Soomi Park’s video. 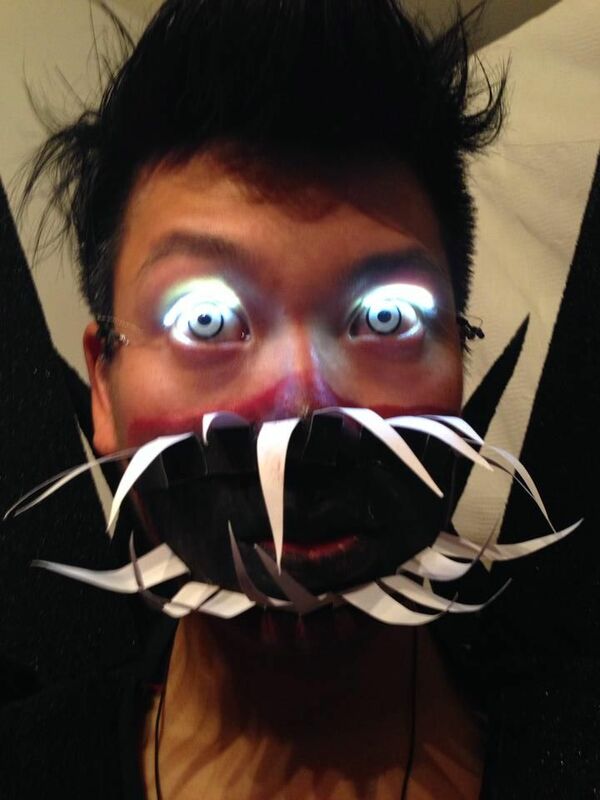 Here, Park uses LED’s to emphasize on the size of the eye. What was so cool about the technology part of the lashes is that they came with sensors. You can turn the lashes on and off by tilting your head. The video itself is kind of “spacey”. I didn’t even know that this existed. I think the whole concept is cool but they are a little too bulky for me. They also come with added materials that are attached to your ear which maybe the sensors. I could see this taking off for a while especially within the Music Video world. 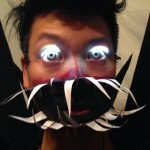 I came across another LED eyelash project pojken. This project was use for costuming. Here the artist uses smaller LEDs. (SMDs). These were made to wear on the top of the eyelid. She also used soldering to help keep them together. This started a journey for me to see if what I wanted existed. I found a whole eyelash design world. There are many different designs to artistically express yourself. 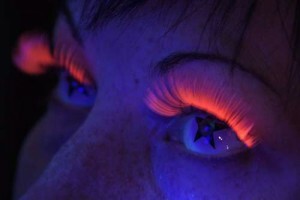 I discovered that there are UV eyelashes in market now. I would like to design or help to find LEDs small enough to put at the tip of eyelashes to where they would appear to be little drops of color liquid at the end of the eyelash. Technically I don’t think a LED exist that can be so small and then would the LEDs be on all the time. Is there a light sensor small enough to communicate to the LEDs when to shut down and when to come on? It would bring your eyes to a whole other level, when it comes to make-up and flirting, don’t you think? For my wearable media object, I chose to create an LEDs-only circuit using the LilyPad Arduino Board. 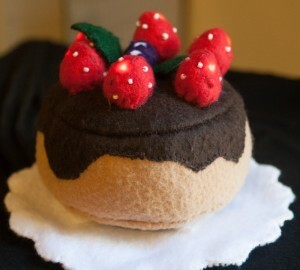 After attending Ettiquette Creative’s LilyPad Arduino Workshop, I had the resources and references to begin my project. 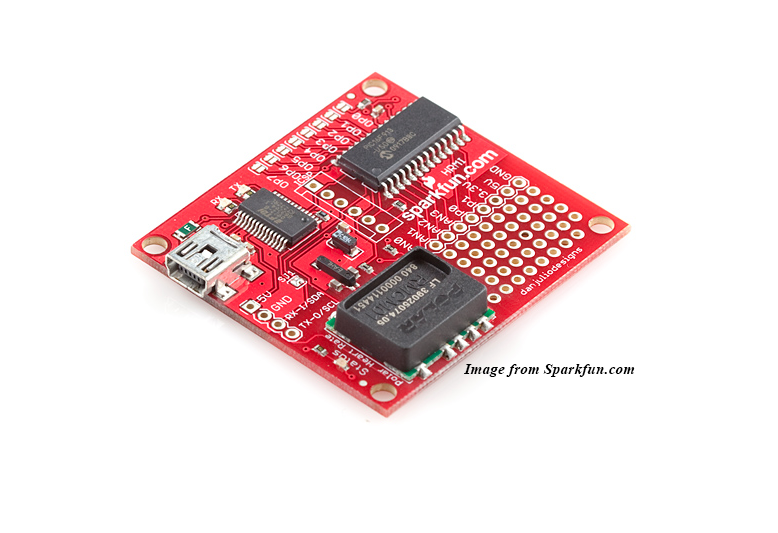 I installed the Arduino software, checked the drivers, and referred to a tutorial provided on the SparkFun Electronics site to design my wearable media object. In order to allow the light display to be the focus of the media object, I sewed the LilyPad Arduino to the inside of the purse. The majority of the stitches are also on the inside of the bag, and the cloth flowers hide the more noticeable threads visible on the outside. My goal with this project was to create a media object that could combine both style and technology. The outside of the purse has cloth flowers that camouflage the sewn-in LEDs. 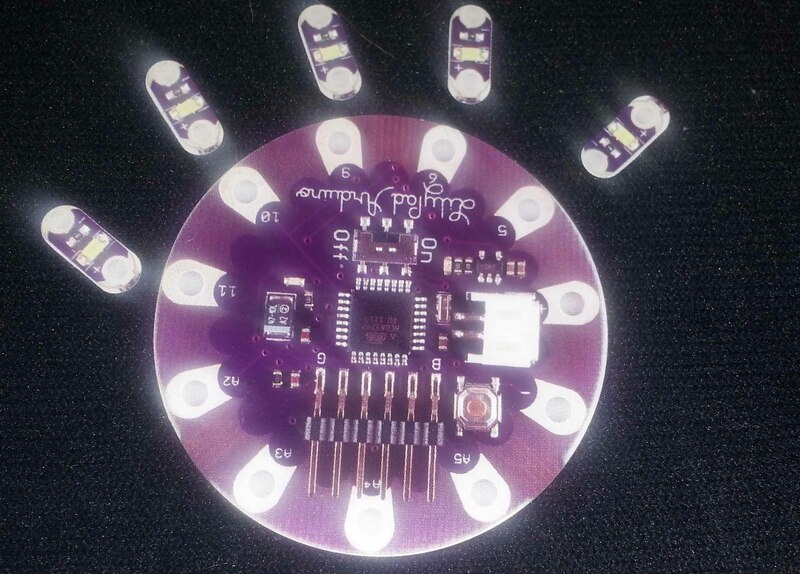 When the LilyPad Arduino is activated, the LEDs blink and fade in a random pattern. The soft blinking lights and smooth pattern are meant to tie back to the idea of flowers being delicate and graceful. While I was working on my project, I wondered if there was a way to make the LEDs respond to the beat in music. I chose the track (in the video) with that in mind. I loved how the lights almost look like they’re dancing to the music. That might be something I’ll look into for a future LilyPad Arduino-related project.